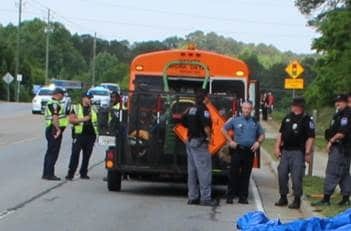 An inmate who was assigned to work detail in Gwinnett County was struck and killed by a motorist Wednesday morning while he was following behind the work detail bus on foot. The inmate has been identified as Hunter O’Conner, a 22 year-old resident of Mableton. O’Conner died on the scene. Lawrenceville Highway near the intersection of Lawrenceville Suwanee Road. 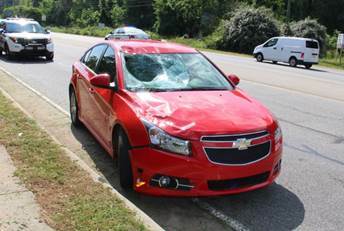 Police say the vehicle involved in the accident was driven by Jennifer Adkins of Buford. According to police, Adkins was distracted and did not see O’Conner. There were no other occupants of the vehicle and no other injuries. Adkins has been charged with second degree vehicular homicide, distracted driving, and following too closely. 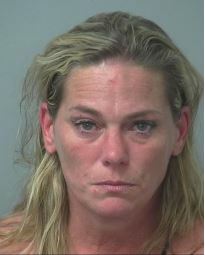 She was arrested and transported to the Gwinnett County Detention Center without incident. Alcohol, drugs and speed and not thought to be factors, however the investigation is ongoing.